1) This paper is a peer reviewed paper prepared for the FIG Congress 2010 in Sydney, Australia, 11-16 April 2010. At the Congress it was presented in a session about Spatial Information for Climate Change Monitoring and Other Natural Disasters Management and draws on the lessons from recent major disasters and existing literature on land issues. Handouts of this presentation as a .pdf file. Key words: climate change, natural disasters, tenure security, disaster resilience, vulnerability. There is evidence linking climate change with an increase in the frequency, severity, and unpredictability of natural disasters in the past decade. Between 1974 and 2003 there were 6,367 such destructive natural disasters, resulting in over 2 million deaths, with 75% of these in Asia alone (Guha-Sapir et al, 2004). Lessons from the 2004 Asian tsunami, recent earthquakes in India and Indonesia, and tropical cyclones in the Philippines and Samoa have highlighted the significant land issues that can arise in the aftermath of the natural disaster. This includes people losing access to land through resettlement, and land grabbing causing loss of connection with pre-disaster sources of livelihood. Since the Asian tsunami there has been extensive analysis of the approaches taken to address these land issues after natural disasters, and the literature contains several case studies and comprehensive reports from international agencies providing guidelines for addressing land issues after natural disasters. This paper concentrates on issues in developing countries in the Asia Pacific and draws on the lessons from recent major disasters and also existing literature on land issues. Coastal communities are often at greatest risk of these events and it is often the poor sections of the community who occupy land at greatest risk. The paper also refers to the links between community vulnerability and tenure security. There is evidence linking climate change with an increase in the frequency, severity, and unpredictability of natural disasters in the past decade. Between 1974 and 2003 there were 6,367 such destructive natural disasters, resulting in over 2 million deaths (Guha-Sapir et al, 2004). The Asia Pacific region includes the volcanic ring of fire in the Pacific and the cyclone and storm paths of East Asia. An analysis of the data on natural disasters in EM-DAT reveals that more than 75% of the total number of people killed by natural disasters between 1994 and 2003 were in Asia (Guha-Sapir et al, 2004). Losses causes by natural disasters are greater in developing countries in Asia and the Pacific, and the poor are particularly vulnerable. While the 2004 Asian tsunami received much press, disasters such as earthquakes, tropical cyclones, avalanches, landslides and floods are also common in many countries in the region. Natural disasters such as these cause damage to land and loss of access to land often results in loss of shelter and livelihoods, sometimes permanently. During the response to the natural disaster there are many tensions and difficulties relating to the relocation of affected communities, the placement of refugee camps, and measures to increase future resilience through avoiding reconstruction on land at risk of further hazards. Vulnerability to disasters is dependent of several factors including the degree of exposure to sites at risk of disaster, social factors such as the level of conflict and discrimination, the strength of the economy, and the level of environmental degradation. Among these vulnerability factors is the level of tenure security for landholders and this will be discussed throughout this paper. One of the lessons from recent natural disasters is that the poorest and politically weakest members of society are the most vulnerable to the impacts of natural disasters. This was the case in the aftermath of the 2004 Asian tsunami with poor landholders most vulnerable to being displaced from their land. In Aceh disputes over land arose, caused by opportunistic land grabbers, and uncertain inheritance rights where the parents had perished (6,000 inheritance cases were filed in the first three months). Also where building foundations were deeply buried and no traces of land parcel boundaries existed, restoring property rights was even more complex (BRR and the World Bank, 2005). There was also the question of whether reconstruction should occur in hazard prone areas. In Thailand the security of tenure was put under even more pressure in tsunami-affected areas within tourist destinations, and areas with high property values. Handmer et al (2007) reported on the displacement of many local people along the Andaman coastline in Thailand following the Asian tsunami, and the incidence of tourism land developers taking control of these areas. They reported that local people were unable to prove formal title over land due to lack of formal tenure or loss of land title documents. This opened up the opportunity for land developers. This is evidence of a breakdown in governance impacting on the land rights of these individuals. Work commissioned by UN-HABITAT and UN-FAO has resulted in several case studies of the land issues following natural disasters including earthquakes in India, the Philippines and Indonesia; the 2004 Asian tsunami, tropical cyclones and floods in Bangladesh and the Philippines; and mudflows and landslides in the Philippines. This work has led towards, among other initiatives, the preparation of a set of guidelines on addressing land issues after natural disasters (Fitzpatrick, 2008). Whilst the nature of the land issues differs depending on the type of natural disaster and the situation of the country, some common lessons can be drawn from this literature. Natural disasters often involve temporary resettlement of large numbers of people and the choice of location should be chosen in consultation with the community, and where possible, be within reach of pre-disaster livelihoods. The risks are that people will be resettled in unsuitable areas and return to affected lands too early, or that conflict will result within the resettlement areas. Principle 2 of the Pinheiro Principles (Inter-Agency, 2007) involves the right to housing and property restitution for refugees and displaced persons, and states that all displaced persons have the right to have restored to them any housing, land and/or property of which they were arbitrarily deprived, or to be compensated where it is factually impossible to restore as determined by an independent, impartial tribunal. In the event of a catastrophe this is a challenge for the central government, especially in developing countries, as the cost of compensation may be very high. Resettlement should not be on land where others have claims unless by agreement with a host community, or on government land. Also, recognition of land rights is important during resettlement and also for subsequent restitution, otherwise people fear eviction. Disasters usually result in high levels of loss of access to productive land, loss of crops and livelihoods. Some people may be forced to sell their land and others may not be able to meet their sharecropping or lease agreements. These pressures can lead to land conflicts. Natural disasters also have a significant impact on the capacity of land administration systems through loss of staff, damage to boundary markers and survey marks, damage to land records and land offices. In most countries in the region the land administration system is weak in any case and the impact of the disaster further weakens the capacity of the land agencies. Soon after the 2004 Asian tsunami, the Indonesian Land Agency (BPN) issued a decree preventing the selling of land in an effort to stop land speculation, and while it is hard to judge the degree of informal land transactions that may have occurred, there were not widespread reports of land grabbing. Existing tenure security issues and problems are highlighted after disasters, and the recovery and reconstruction phase is an opportunity to assess these. Disasters affect urban and rural lands and invariably a range of tenures and forms of access rights to land. Often the landless (labourers and sharecroppers, etc) and people with insecure tenure are the most vulnerable to disasters. There is a need to quickly assess previous formal, and informal land rights that existed prior to the disaster, and these often vary in legal and social legitimacy. In some cases long established customary rights exist without legal recognition. Recognition of informal tenure and partial rights such as squatters, or sharecroppers, or renters is necessary but more difficult to adjudicate. So, a flexible approach to adjudicating and validating land tenure is needed. There is an urgent need for adjudication of rights, prior to construction, to determine eligibility for assistance for rebuilding or reconstruction. However, the sheer scale of the challenge facing those responsible for the emergency response is often enormous. During the emergency response and subsequent recovery a trade-off is needed between rebuilding homes as quickly as possible, and undertaking a transparent and community driven process. Often the land records needed to make decisions on pre-disaster rights to land are either out of date or have been destroyed. Also, a loss of personal records and formal government land records complicates the adjudication process. Therefore decisions on the adjudication of rights to land should be made in close consultation with the community and where possible be based on consensus. The lessons from recent natural disasters provide an opportunity to consider what actions communities at risk of natural disasters can take to reduce their vulnerability to natural disasters and increase their resilience in the event of a natural disaster. This is of particular importance to the poorer coastal communities in the Asia and Pacific region as the potential for rising sea levels and more frequent storm events increases their vulnerability. Natural hazards such as tidal surges, landslides, floods, cyclones, hurricanes and volcanic eruptions can affect communities on a recurrent basis. The urban poor in coastal communities are often at greatest risk of these recurrent events and it is often the poorer sections of the community who settle in hazard prone areas. In many cases the land they occupy is not subject to building controls and settlements development with informal dwellings and no legal recognition of their land tenure (Quan and Dyer, 2008). Secure land tenure provides a degree of economic security for the landholder and, assuming appropriate governance, provides protection against other interests. In a seminal World Bank publication on property rights, Deininger (2003) stated that “tenure security depends on a host of objective and subjective factors, including the clarity with which rights and obligations are defined; the quality and validity of property rights records and whether or not the state guarantees them; the precision with which boundaries are demarcated; the likelihood that rights will be violated; the ability to obtain redress by an authoritative institution in such cases, along with the reassurance that whatever measures the institution decides are deemed appropriate and can be enforced effectively. Deficiencies in any of these areas, or a mismatch between different components of the property rights system, can seriously undermine tenure security, thereby increasing the potential for conflict and undermining the incentives for investment and change”. Over the last 15 years various countries in the Asia and Pacific region have implemented land administration projects that involve the creation and registration of land titles. The objectives of many of these land administration projects have been to improve tenure security and access to land, potentially resulting in more efficient agricultural production and improved livelihoods, improved governance and equity (Mitchell et al, 2007). However, many countries in the Asia Pacific region do not have a formalised land tenure system and rely on customary arrangements, and other types of informal tenure. Whilst such arrangements might have been suitable in traditional and historical circumstances, pressures on land tenure due to climate change will result in an altogether different reality. Even in countries with land titling programs, much of the occupied land remains under state control, or lies outside the scope of the titling project. Land that is agriculturally marginal, or hazard-prone, tends to have no formal land tenure in place and the occupiers have settled there because they don’t have claim to any other land. They typically have very poor infrastructure and limited government support. In hazard-prone areas this presents a problem as they are at high risk of the impact of a natural disaster and also very vulnerable to loss of access to land and the livelihoods they derive from the land or associated water resources. Natural hazards such as floods may only affect a community or agricultural land every few years, but the damage can be significant. Landholders need to find ways to live with the threat of the disaster, respond when the disaster occurs, and to rebuild their homes and livelihoods after the event. Tran et al (2007) argued that the Vietnamese people are very used to living with severe floods and this is embedded in their culture. Accordingly they have had a large system of river and coastal dykes in place to control flooding for centuries, and this has worked on most occasions. However, they add that “this structural approach to flood control is now under pressure because the conditions inducing flooding are intensifying, both at the local and global level…For example, population increase, rapid urbanization, high demand for natural resource exploitation, environmental pollution, and degradation are coupled with global threats, such as climate change”. This theme is continued by Satterthwaite et al (2007) who argue that in addition to government adaptive response, the urban poor demonstrate a significant capacity to undertake measures such as building shelters and drainage channels to protect themselves and their properties from flood risks. This was the experience also in Aceh where Fitzpatrick and Zevenbergen (2007) reported that “coastal communities proved remarkably resilient after the tsunami…community-based methods and approaches proved the most successful in fostering sustainable and largely conflict-free recovery”. However, Quan and Dyer (2008) argued that “Such autonomous adaptations are however constrained by insecure land tenure which creates disincentives for people to invest scarce resources in risk reduction. For both new and existing settlements more secure land tenure is required so as to improve resilience to sea level rise related risks by promoting investments in better housing and community infrastructure”. Analysis of recent natural disasters has provided lessons for future Disaster and Risk Management (DRM). 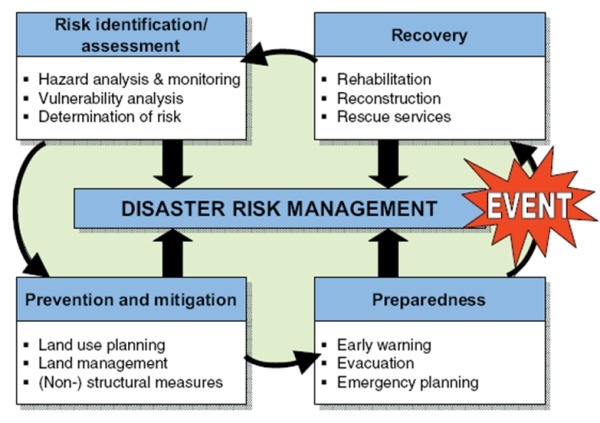 Figure 1 provides an overview of the post-disaster processes in a typical DRM framework that includes recovery, risk assessment, prevention, mitigation and preparedness. Each of these stages provides opportunities for improvements to land administration and management that lay the basis for reduced vulnerability. Responses to natural disasters need to consider land issues in the preparation for early recovery. Secure land tenure is important in responding to natural disasters in terms of allocating assistance and retribution in reinstating homes and livelihoods. However, if land tenure is unclear or uncertain, post-determination will be difficult and may exacerbate the negative impact of the weather event and undermine community cohesion and peace-building. There is also often an inevitable need to relocate people due to changed conditions following the natural disaster. This was the case in Aceh following the tsunami. A sudden tectonic plate movement in Sumatra caused the tsunami and also pushed down the coastal shelf along much southern Aceh, especially around Singkil (BRR and the World Bank, 2005). The result was that many areas are now 1.5 meters lower than prior to the tsunami and much of the previously occupied land is flooded every high tide. This inevitably led to decisions on where people should be relocated and the likely impact on their livelihoods. Lessons from responses to the Asian Tsunami indicate that tenure will be secure in natural disaster responses where there is adequate land administration data or the land records received little damage, landholders have documentary evidence of legal rights to land, the land administration system is responsive and flexible, and the governance arrangements of land administration agencies allow for fast and transparent processes for claims to land and inheritance. The question of whether or not to rebuild in hazard-prone areas is also significant. In addition, proof of ownership brings the possibility of using the land as collateral for investments in disaster recovery actions. In face of these challenges, the strength and cohesiveness of the local community as very significant in the protection of property rights in the event of a natural disaster. Following the recovery phase following a disaster there are opportunities to reflect on the land issues that have arisen and develop risk reduction measures what will reduce the vulnerability of those at risk. Formal recognition by government of all valid forms of existing tenure is paramount. Disaster mitigation should therefore include an assessment of the security of tenure in areas at risk of natural disasters and the communication of the results to the community. In particular, the rights of women and children and disadvantaged social groups should be identified. This would place landholders in a stronger position to negotiate in the event of a natural disaster. The first part of this opportunity is improving the capacity of the land administration to cope with future events. The developing countries in the Asia Pacific region are quite diverse in land tenure systems and governance arrangements, which makes it hard to generalise. However, there are large areas of customary land in many of these countries. On private land informal arrangements are more common than land titles. In most of these countries there are problems with the capacity of the land administration system that exacerbate the challenges in the event of a natural disaster. An improvement to the capacity of land offices in areas at highest risk of natural disasters is important in reducing vulnerability for those with land titles. Capacity building of land institutions is central to improved governance as many existing institutions do currently have the capacity to implement the DRM measures required. This capacity building could take the form of training staff in the land issues that arise after disasters, developing an inventory of informal rights to land, and taking steps to protect the land records and survey infrastructure from the impact of a natural hazard. With improved capacity in the land administration agencies comes an opportunity for land experts to be more involved in the improvement to tenure security. 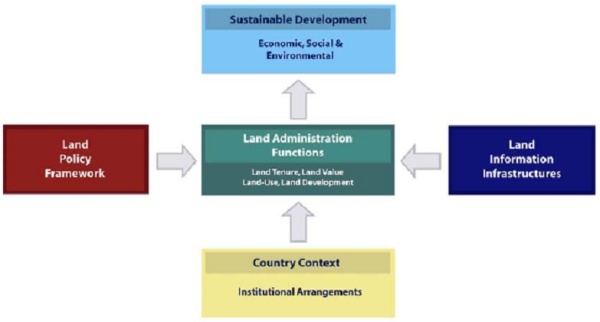 The land management paradigm outlined by Enemark (2004), describes land management as the components of land administration as land tenure, land valuation, and land use management, supported by a land policy framework and land information infrastructure (See Figure 2). The most significant long-term impact that land administration can have on vulnerability is the improvement of tenure security for those without legally recognised rights to land. This applies to both privately occupied land and to collectively managed land. Brown and Crawford (2006) presented the results of a survey of humanitarian and development professionals, commentators and academics involved with disaster management and mitigation. They reported that the respondents agreed that clarity over private and communal land ownership was critical to the effective reconstruction of disaster-affected regions. This clarity allowed them to provide secure credit for reconstruction, and allowed them to benefit from any compensation packages that may be offered. However, improving tenure security is by nature a complex and long-term process and it is widely considered that improvements to tenure security should be incremental and progress up a ‘ladder of rights’ (GLTN 2008, Barnes and Riverstone 2009). The development of an updated land policy framework is the appropriate way to commence the process of improving tenure security. Lessons from previous disasters should be catalogued and used as a basis for the development of land policies that consider land tenure issues in hazard-prone areas, using a participatory and transparent process. Previous experience suggests that the success of implementation of land policies will inevitably be depend on a range of factors including governance, political will, and the degree of public involvement in the development of the policies. Closely related to improvements to tenure security is the necessity to educate the public about their rights to land, so that they are less likely to be taken advantage of in the event of a disaster. Part of this responsibility lies with the land agencies to undertake community education programs about land polices and laws and their rights within these. Improvements to land valuation also are important to reducing vulnerability to inadequate compensation where loss of land occurs following a natural disaster. Approaches to DRM can also make allowances for compensation payments in the event of a disaster. Developing up-to-date land valuation maps and records will provide a basis for discussion of compensation. Information of this type places the landholders in a stronger bargaining position with government when compensation is discussed. Land use management (or physical planning) also has a role to play in reducing vulnerability. Land use master plans that consider the risk of settlement in hazard-prone areas are important. Decisions on resettlement should be made in consultation with land experts and in high-risk areas the choice of potential resettlement sites in the event of a disaster could be made in consultation with the public prior to the occurrence of a natural hazard. In extreme cases there may be a need to consider whether some people should be permanently resettled to areas with less risk. However, there are many potential problems with this approach and decisions need to be made in close consultation with the landholders otherwise they risk loss of tenure security, loss of access to previous livelihoods and social fragmentation. For example, after the 2004 Asian tsunami the Sri Lankan government created coastal zones of between 100m and 300m preventing housing construction in tsunami affected areas an effort to avoid a repeat of the devastation. This would have resulted in the relocation of many thousands of people and risk increasing tensions between resettled and existing communities (Brown and Crawford, 2006). These restrictions were eventually relaxed. The Hyogo Framework for Action (ISDR, 2005) calls for, among many recommendations, for disaster risk assessments to be incorporated into urban planning and management in disaster-prone settlement areas. This is endorsed by Enemark (2009, p12) who states that “Integration of all aspects of the disaster risk management circle…into the overall land administration system will enable a holistic approach that should underpin the general awareness of the need for being prepared for natural disasters and also being able to manage actual disaster events”. The respondents in the survey by Brown and Crawford (2006) believed that poor land-use planning increased disaster vulnerability through delays to reconstruction, and increased tensions between those competing for scarce resources. In the absence of cohesive land use planning prior to a natural disaster one of the issues that invariably comes up during reconstruction efforts is whether humanitarian and development organizations should take advantage of the significant severance between people and their landholdings to implement more sustainable land ownership systems moving forward. “The progressive ingredients of urban land policies to upgrade informal settlements, improve tenure security, increase delivery of appropriate land through public-private collaboration, simplify and strengthen planning arrangements, and extend popular participation therefore all have a significant role to play by improving the incentives and flexibility for individuals, small businesses and communities to adapt to the risks of sea level rise”. By bringing land administration and physical planning closer together, and supported with disaster risk information better decisions on land tenure and land use are possible, and the poorest will benefit. There is growing evidence that climate change will lead to an increase in the incidence of natural disasters. The likelihood is that recurrent events such as tidal surges, cyclones, and floods will become a greater problem for some communities. Unfortunately the people most vulnerable are often the poorest section of the community, and often live in areas with informal tenure. Security of tenure is an important factor in the reconstruction and restitution after a natural disaster and should therefore be considered as an element of the vulnerability of communities to natural disasters. Improved tenure security strengthens the negotiation powers of the poor, and can reduce the likelihood of land grabbing, assist in reconstruction efforts and help with access to collateral for financing reconstruction. Education of individual’s property rights and level of tenure security is also important. Land administration and management can reduce the vulnerability of people to natural disasters through improved capacity to make decision on land, the development of land policies that includes the lessons learned from previous disasters, the development of land valuation records in at-risk areas, and the development of sound land use master plans that consider risk areas and resettlement options in consultation with the community. The author wishes to thank his colleagues in the School of Mathematical and Geospatial Sciences for their input and support. Badan Rehabilitasi dan Rekonstruksi (BRR) and the World Bank, 2005, Rebuilding a Better Aceh and Nias: Stocktaking of the Reconstruction Effort - Brief for the Coordination Forum Aceh and Nias (CFAN). For the people of Aceh and Nias, October 2005. Barnes, G. and G. Riverstone, 2009, Exploring Vulnerability and Resilience in Land Tenure Systems after Hurricanes Mitch and Ivan. Accessed 12/12/09. Brown, O., and Crawford, A., 2006, Addressing Land Ownership after Natural Disasters: An Agency Survey, International Institute for Sustainable Development (IISD), Winnipeg, Canada. Deininger, K., 2003, Land Polices for Growth and Poverty Reduction, A World Bank Policy Research Report, World Bank and Oxford University Press. Enemark, S., 2009, Sustainable Land Administration Infrastructures to support Natural Disaster Prevention and Management, UNESC, Ninth United Nations Regional Cartographic Conference for the Americas, New York, 10-14 August 2009. Fitzpatrick, D., and Zevenbergen, J., 2007, Addressing Land Issues after Natural Disasters: A Study of the Tsunami Disaster in Aceh, Indonesia: Draft. Fitzpatrick, D., 2008, Guidelines on Addressing Land Issues after Natural Disasters: EGM Draft 21-23 April 2008, UN-HABITAT/UN FAO/UNDP. Global Land Tools Network, 2008, Secure Land Rights for All. Nairobi, UN-HABITAT. Guha-Sapir, D., Hargitt, D., and Hoyois, G., 2004, Thirty years of natural Disasters 1974 – 2003: The Numbers, Centre for Research on the Epidemiology of Disasters, http://www.unisdr.org/eng/library/Literature/8761.pdf, Accessed 22/09/2009. Handmer, J. And Choong, W., 2006, Disaster resilience through local economic activity in Phuket, The Australian Journal of Emergency Management, Vol. 21 No. 4, November 2006. Inter-Agency, 2007, Handbook on Housing and Property Restitution for Refugees and Displaced Persons: Implementing the 'Pinheiro Principles'. Turin, FAO/iDMC/OCHA/OHCHR/UN-HABITAT/UNHCR. ISDR, 2005, Hyogo Framework for Action 2005-2015: Building the Resilience of Nations and Communities to Disasters. World Conference for Disaster Reduction, Kobe, Hyogo, Japan. Mitchell, D., Clarke, M., and Baxter, J., 2008, Evaluating Land Administration Projects in Developing Countries, Land Use Policy, 25(4) pp. 464-473. Quan, J., and Dyer, N., 2008, Climate Change and Land Tenure: The implications of Climate Change for Land Tenure and Land Policy, IIED, UN FAO Land Tenure Working Paper 2, ftp://ftp.fao.org/docrep/fao/011/aj332e/aj332e00.pdf, Accessed 03/08/2009. Satterthwaite D., Huq, S., Pelling M., Reid H., Lankao P.R. (2007) Adapting to Climate Change in Urban Areas: The possibilities and constraints in low- and middle-income nations, Human Settlements Discussion Paper Series, IIED available at http://www.iied.org/pubs/pdfs/10549IIED.pdf, Accessed 21/09/2009. Tran, P., Marincioni, F., Shaw, R., Sarti M., and An, L., 2007, Flood risk management in Central Viet Nam: challenges and potentials, Natural Hazards, Volume 46, Number 1 / July, 2008. David Mitchell is a licensed cadastral surveyor and worked in private practice for 12 years before joining RMIT University, where he has been for 12 years. He is the Australian delegate to FIG Commission 7. David is an international land administration consultant and undertakes research at RMIT University focusing on the development of effective land policy and land administration to support tenure security, improved access to land and pro-poor rural development.